The death last Saturday of H.R.F. Keating has robbed us of a giant of the genre. Much has already been said by obituarists about his novels, featuring Inspector Ghote and others, which earned two CWA Gold Daggers, so I’d like to focus on other aspects of his career. He was both imaginative and daring in his work. He wrote a long crime story in verse and dreamed up an unlikely but effective sleuth in the cleaner Mrs Craggs. His prose style was sometimes quirky, and very good at getting points across. And his work was full of ideas that gave clues to his considerable intellect. Harry was not only a prolific reviewer, but an insightful commentator on the crime genre. He edited a book of excellent essays about Agatha Christie, a collection of stories honouring Julian Symons, two CWA anthologies, a study of crime writers past and present, and a first rate pot pourri called Who-Dun-It - as well as choosing 100 classics of the genre for a book that contained short and pithy accounts of why those particular stories would stand the test of time. He wrote with affection about the Golden Age in Murder Must Appetise. I found him personally generous and kind. He provided a quote for the cover of The Devil in Disguise, and he and his wife Sheila Mitchell invited me to be their guest at the top table at Malice Domestic the night he received a lifetime achievement award. In latter years, we shared a publisher. Most recently, I enjoyed their company at Detection Club dinners. I shall miss him, but remember him with affection and admiration. Blood Work is a 2002 movie starring and directed by Clint Eastwood. I’ve just watched it and really enjoyed it – definitely a cut above the typical serial killer thriller. This is partly because Eastwood is a class act, and partly because the story comes from a novel by the excellent Michael Connelly. Eastwood plays Terry McCaleb, an FBI profiler who is taunted by a serial killer. Chasing the culprit, he suffers a heart attack, and needs a transplant. He retires to live on a boat, but then the sister of the woman who donated her heart to him comes looking for help. The donor was murdered – but by whom? The crime seems to be linked to another killing, and Eastwood finds out what really connects the murders, ultimately discovering that the trail leads back – to himself. Along the way, he and the sister (the glamorous Wanda de Jesus) start a relationship. The finale is exciting and very well done. I thought this film was very entertaining, and didn’t need to resort to too much gore to be gripping. There’s a rather nice cipher clue, and the photography is at times evocative, especially during Eastwood’s confrontation with the killer. Recommended. I'm gratified that Allison & Busby have decided to reprint the third Lake District Mystery, The Arsenic Labyrinth, and equally pleased that, in doing so, they have arranged for a new paperback cover with artwork in the same style as the other books in the series. How important is jacket artwork? It seems to count for a great deal, perhaps more than many writers (including me!) would like to think. Fortunately, I'm very keen on this latest style of cover, and I'm glad that all books in the series to date will now be available in that style. As for the book itself, it is quite a favourite of mine. Much as I enjoy writing about Hannah Scarlet and Daniel Kind, I really loved writing the various scenes that feature Guy and his unlucky landlady. Their doomed relationship fascinated me, and it seems to have appealed to quite a few readers as well. P.G. Wodehouse wrote a number of stories with a crime element, and admired Agatha Christie. She liked his work, too, and it’s a pity the two of them never collaborated. Had they done so, they might have come up with a book as good as The Poisoned Chocolates Case, by Anthony Berkeley. This whodunit is a classic of the genre, which I first read many years ago. I decided to take another look at it, and found it was at least as good as I remembered - which is saying something. It’s clever and witty and quite unique. Its genesis was a short story called ‘The Avenging Chance’. In the novel, written in 1929, Berkeley has the six members of the Crimes Circle (based, no doubt, on the then embryonic Detection Club) come up with different solutions to the puzzle of who killed Joan Bendix. Roger Sheringham’s solution derives from the short story – but here it isn’t the right answer to the puzzle. There are, in fact, two more twists in store. In 1979 Christianna Brand came up with yet another solution. All this makes Berkeley’s point, that the solutions to a fictional mystery are potentially endless. I love the way he keeps shifting the kaleidoscope in this story. It deserves its status as a masterpiece of the Golden Age. I'm delighted to report that I have received my copy of the Scorpion Press limited edition of the latest anthology that I have edited on behalf of the Crime Writers' Association, Original Sins. Although I once contributed a short story to an anthology that was turned into a limited edition, this is the first time that a book I have edited myself has been produced for the collectors' market. Scorpion Press have been producing very attractive collectors' editions for about 20 years now, and I'm very pleased with their work on Original Sins. It is beautifully bound, and contains the signatures of all the contributors – including such leading lights of the genre as Reginald Hill, Christopher Fowler, Sophie Hannah and Andrew Taylor. A special feature of the book – which did not appear in the mass-market hardback or paperback editions published by Severn House towards the end of last year – is an essay written by Michael Johnson, who runs Scorpion Press. This celebrates the work of the late Lionel Davidson, and Michael and I thought it was appropriate to pay tribute to Lionel's distinguished career in a CWA anthology, given that he won no fewer than three CWA Gold Daggers. The reality is that relatively few of us buy mysteries in hardback at any time, let alone in rather more expensive limited edition formats. However, if you are ever on the lookout for a really attractive present of a special nature for a true mystery fan, it is worth keeping the productions of Scorpion Press in mind. I have picked up a few of their books over the years, and they are prized possessions. And Michael's dedication to the cause of publishing beautiful crime books does, I think, deserve a great deal of support. Today I’d like to highlight two books that have just landed on my doorstep – much to my delight. They are by writers whom I’ve known – and read! - for a number of years. They are both novelists who respect the traditions of the classic whodunit, while giving it a contemporary flavour. I’ve mentioned each of them before in this blog, and a new title from either of them is certainly something to savour. 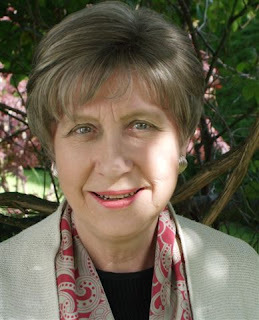 Aline Templeton is a Scottish writer who has written several stand-alones, but in more recent times has tended to concentrate on books about a likeable series cop, DI Marjory Fleming of the Galloway Constabulary. Her latest is Cradle to Grave, now in paperback and published by Hodder As the title implies, the key character is a nanny, Lisa Stewart, who is suspected of killing a child in her care. Lisa is an enigmatic woman; she has a temper, and puts up barriers to protect herself which make her difficult to warm to. But is she a killer? Strong characterisation and well-evoked settings are always the hallmarks of an Aline Templeton novel. It’s astonishing to me to realise that The Jackal Man is Kate Ellis’s fifteenth novel about another – but very different – DI, Wesley Peterson. She manages to be prolific without ever sacrificing quality and there is an atmospheric and sometimes almost exotic flavour to her plotting which really is most appealing. In this book, two young women are found dead. Is there a link to a ritual connected with Anubis, the jackal-headed Egyptian god of death and mummification? And who could resist a set-up like that? Aline and Kate seem to me to be typical of the best type of modern British mystery writer, producing entertaining books that not only well-constructed but contain plenty of insights into human nature and the world of today (and, in Kate’s case, are also plenty of historical lore). They are both friends of mine, but I won’t let any lack of impartiality deter me from encouraging others to give them a try! You can probably imagine that, for any writer, the initial reaction to a new novel is awaited eagerly but with some trepidation. It is difficult to judge one’s own work, and the opinions of friends (and sometimes even agents and editors) aren’t necessarily a guide to wider reaction among the leading critics. And after that bit of trumpet-blowing, I'll do a post tomorrow about two other writers! Over the past few months, I have mentioned Milward Kennedy a number of times in this blog. I find him rather interesting as a Golden Age detective novelist – not in the same league as Anthony Berkeley, I must admit, but equally interested in doing something different with the detective story and adding more than a touch of humour. My choice for today's Forgotten Book is a Kennedy novel that dates back nearly 80 years and which, I would like to bet, not many of my readers have heard of, let alone read. Bull's Eye is a rather unusual, if somewhat meandering, mystery in the country house tradition which offers quite a few ironic touches worthy of Berkeley. This was the book that introduced Sir George Bull, who is hired as a private detective by a woman who appears to have rather more money than sense. The matters that Sir George is asked to investigate seem relatively trivial, but no sooner has he joined one of those house parties so common in Golden Age books than a rather shady character dies in mysterious circumstances. Sir George duly decides to investigate. One of the things that puzzled me when reading this book was the curious way in which Kennedy characterised Sir George. I thought this was a failing, but the final chapter cast a rather different light on Sir George's activities. The humour deployed throughout is not quite strong enough for a modern reader to be bowled over with admiration for Kennedy's wit, but the story is interesting and original enough to me to understand why Kennedy decided to bring Sir George Bull back in a subsequent novel. I was delighted to receive recently a copy of the brand-new reprint by HarperCollins of a classic detective story which I have mentioned before on this blog – The Floating Admiral. It is one of the round-robin mysteries put together by members of the Detection Club and is by common consent the best. An obvious selling point of the book is that the contributors included such stellar names as Agatha Christie and Dorothy L. Sayers, while G.K. Chesterton – the first president of the detection club – contributed an introduction. The ingenious Anthony Berkeley undertook the toughest task – that of writing the final chapter which pulls all the threads together – with considerable aplomb. The other contributors included names which are now largely forgotten today, although I have mentioned quite a few of them in this blog – an example is Canon Victor Whitechurch. The excellent Henry Wade and the reliable if plodding John Rhode also feature. And in this edition the scene is set by the detection club's current president, Simon Brett. I do find round-robin mysteries intriguing, even if some of them are not entirely successful. The Floating Admiral is more than a historical curiosity; on the whole, it is pretty good example of 1930s detective fiction. A while ago, I myself contributed a chapter to a round-robin mystery organised by a literary Festival. As yet, unfortunately, it hasn't seen the light of day, but I must say that I'm looking forward to finding out what happened to resolve the conundrum that I helped to create! The work of a coroner is sensitive, socially important, and often challenging. It is also, to my way of thinking, absolutely fascinating. A great many crime writers have, over the years, featured coroners and inquests in their work, and I did myself in Waterloo Sunset, the most recent Harry Devlin novel. I was given a great deal of help with my research by two Liverpool-based coroners, and talking to them left me in considerable admiration at the way in which they did their work. Dealing with the bereaved is never easy, and it seems to me but one of the most important personal qualities that any corner can have is a strong sense of empathy. There is no doubt that Priscilla Masters' regular character, the Shropshire coroner Martha Gunn, has the necessary attributes, and they are called upon again in her third and latest outing, Frozen Charlotte. This novel opens in striking fashion, with the arrival of a woman at the Accident and Emergency department of the Royal Shrewsbury Hospital one cold winter's night. The woman brings with her a baby, but when a nurse takes a look, she shocked and revolted to find that the child is mummified. From this chilling beginning, Priscilla Masters fashions another of her well-constructed mysteries. As ever with this author, the characters are carefully delineated, and Martha's personal life again features significantly, but without detracting from the development of the story. The believability of the background derives from Priscilla Masters' knowledge of her subject. She happens to work part-time as a nurse at the Royal Shrewsbury Hospital and in an author's note at the end of the book, she describes how she first encountered the porcelain dolls known as Frozen Charlottes. With this book, Cilla Masters has moved to a new publisher, Severn House, but as usual she has produced an entertaining and highly readable mystery. I've mentioned before, but possibly should declare again, that Cilla is a friend of mine, but I really do think that she is an under-estimated writer, and I very much hope that this book brings her the wider recognition her novels deserve. My choice for today’s Forgotten Book is Thou Shell of Death by Nicholas Blake. It dates from 1936, and was the author’s second book featuring the likeable investigator Nigel Strangeways. The Blake name concealed the identity of Cecil Day Lewis, who was Poet Laureate from 1968 until his death in 1972. I haven’t read many Blake books over the years, but this one impressed me so much I will soon seek out others. It’s a well-written story, as you would expect, but the plot is also absolutely excellent. Sure enough, O’Brien is found shot dead on Boxing Day in a hut surrounded by snow. A near-fatal attack is followed by a cleverly contrived murder – which member of the Christmas house party is responsible? The solution is splendid, with a literary clue that I failed to spot. A classic of the Golden Age, which I recommend. Life at the moment seems rather hectic and demanding, but there are a number of things that I'm looking forward to in the coming months. A real highlight in May is bound to be Crimefest in Bristol, which is always a fun event. Amongst other things, I'm hoping to get the chance to say hello to quite a number of fellow bloggers and readers of this blog. I will be moderating a couple of panels, including a session on "forgotten authors", which has proved very popular in the past two years. I'm glad to say that two of my fellow panellists, Peter Guttridge and Adrian Magson, both have books coming out shortly, published by Severn House, whose crime list is expanding at the moment in a very impressive way. Peter's book, The Last King of Brighton, is set in that fascinating resort which has been the setting for some marvellous works of crime fiction. Adrian's novel, Tracers, is his second thriller to feature former MI5 officer Harry Tate. Two more novels but I'm really keen to find time – somehow! – to read before long. I'm also very much looking forward to the television series based on the books that Ann Cleeves writes featuring Vera Stanhope. I was sorry to miss out on a launch of Ann's latest mystery, which was attended by Brenda Blethyn, who will star as Vera Stanhope on the small screen. But thanks to Mike Stotter, I have permission to reproduce this photo of Brenda with Ann at the launch, a reminder of a show that a great many people are eagerly anticipating – including me. On Saturday evening, I took part in the nationwide celebrations of World Book Day, giving a talk and hosting a performance of my Victorian murder mystery event at Timperley library in the borough of Trafford. And it was all very enjoyable. There was a very good audience and I like to think that it was not just on account of the book giveaways that were part of the event this year! I have written before about the valuable part that libraries play in their local communities, and this was very evident on Saturday, as the library also hosted a talk and film show about the history of Trafford. The film was fascinating, and although it only dated back 80 years, it seemed to portray a totally different world. I know there is a lot of debate about whether it is a good idea for vast numbers of books to be given away free. Most readers are surely bound to welcome this kind of initiative, but some booksellers worry about it, while some writers may fret that it keeps the spotlight was on the bestsellers who do not really need publicity as much as new and mid-list writers. The concerns strike me as reasonable, but on the whole it seems to me that any initiative that encourages readers, and fosters an interest in books has to be a good thing. On Saturday also I was pleased to see the first advance review of the forthcoming US edition of Take My Breath Away. 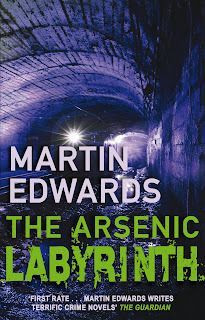 Kirkus said "Edwards spins a rattling good yarn, rich in incident and plot twists", and who am I to argue? Labels: Take My Breath Away, Who Killed George Hargrave? I’ve watched another in the 1982 TV series of Agatha Christie’s Partners in Crime, starring Francesca Annis and James Warwick as Tommy and Tuppence Beresford. This story was The Unbreakable Alibi, and really it is a skit on the work of Freeman Wills Crofts, the alibi king, whose patient cop Inspector French tirelessly unravelled the most complex alibis. You tend to wonder why criminals in the French era bothered with such elaborate plans when the great man had his train timetable ready to consult at every opportunity. The story was light but agreeable, with a bit more substance in terms of plot than some of the others I’ve seen in this series. As ever, Annis’ vivacious performance keeps it all going pretty well. It did make me wonder about the emphasis that crime writers place on alibis. The high water mark was surely in the Golden Age, when Crofts was at his peak, in the 20s and 30s. Writers did rather depend on the trains running to time. After J.J. Connington wrote The Two Tickets Puzzle, Dorothy L. Sayers doffed her cap to him and his book when elaborating upon his idea a year or so later in Five Red Herrings. I mentioned recently an interesting and enterprising print on demand publishing venture called Langtail Press and I have now read one of their books. This was The Lenient Beast by Fredric Brown, first published in 1956. I may not have said very much about Fredric Brown in this blog over the years, but I'm a huge fan of his work. I've read half a dozen of his novels, as well as some of his first-class short stories, and none have disappointed. And The Lenient Beast certainly lived up to my expectations, high as they were. The first chapter gets the book off to an excellent start. John Medley, apparently a respectable bachelor with a taste for classical music, discovers a man's body in his backyard one morning and called the police. The dead man has been shot and a murder hunt is launched. The story is short, crisp and fascinating and a clever feature is the way Brown uses multiple viewpoints, so that we see the same events from different perspectives. The characterisation, especially of a cop of Mexican origin, is excellent and the setting in Tucson, Arizona is vividly conveyed. I also thought that the depiction of racial prejudice was very well done. What is more, the murder motive is memorable – my only quibble is that I had a rather similar idea some time ago and am dismayed to discover that it is not as unique as I thought! I can recommend this book, as well as Fredric Brown's crime writing in general (he also wrote science-fiction, but I have never read any of that.) Langtail Press have done modern readers a real service by making this book available. I was really pleased when Jessica Mann responded to my suggestion that she write something about how she got started as a writer. It's the sort of topic I find really interesting, and I'm especially keen that we hear more about writers past and present who - like me - are by no means household names. 'When Martin emailed saying he had acquired a pristine first edition of my first novel, A Charitable End, I read it again myself and found a story I’d forgotten in a tone of voice I hardly recognize. Then Martin asked me to write something about how I got started as a crime novelist. In my head, I’d been a writer ever since I could read and was determined to be the youngest published novelist ever. I was broken-hearted at seventeen to discover that Pamela Brown had been only sixteen when The Swish of the Curtain was published. All the same, to write a novel and get it published was still my ambition though deferred and deferred again as I went to Cambridge, got married, moved to Edinburgh where my archaeologist husband was a university lecturer and had children. Many writer friends have told me that they always felt, exactly as I did, that holding a hardback volume with one’s own name on the spine was more than a simple ambition or life-plan, it was something without which life would have been meaningless. But I had still produced little more than random scribbles when Charles was appointed to a chair at Leicester. I suddenly realised that it was now or never: write that novel before we moved south or accept that it wasn’t ever going to happen. So, at last, I got down to work, half-an-hour here and half-an-hour there, whenever I could get away from our three (at the time) small children. I have had an irregular working timetable ever since. Why crime fiction? Partly because that was what I liked reading; partly because I was interested in what happens when the thin ice of civilised society cracks or breaks; and partly because it was a genre that was by definition not autobiographical. I had no wish for my writing to be any kind of emotional strip-tease. As I was to realise when I wrote a book about women crime writers (Deadlier Than The Male, 1981) the grandes dames of crime fiction all used it as a kind of barrier between themselves and self-revelation. A Charitable End came out in 1973. In various ways it’s become a period piece. First of all, at 60,000 words it’s less than half the length of most 21st century crime novels. It’s written in a less colloquial style than is usual now. And it’s about middle class people. It has become fashionable to suggest that crime fiction can only be regarded as realistic if it concerns gritty low-lifes, and investigation is only worth following if it’s performed by cops. The Edinburgh that Ian Rankin and Quentin Jardine describe or the Edinburgh of the current new wave of Scottish noir, is a very different place from the city in which A Charitable End is set, in the beautiful Georgian New Town where we lived ourselves amidst middle class respectability. Our friends were lawyers, doctors, journalists, academics (all men) and their wives who, in those pre-liberation days, didn’t have jobs, but probably did voluntary work – do-gooders, as they would later be derisively termed (would a do-badder be preferable?). I was writing about a society and a setting familiar from my own experience. But I’ve always insisted that everyone and everything else in the book was pure invention. Now, wouldn't it be great if a bit of blogging could inspire a sequel to a book dating back four decades?! I have just learned of the death of Barbara Whitehead, who was a friend and colleague in the northern chapter of the CWA for around 20 years. She was born in 1930 and, sad to say, had been suffering from Alzheimer's disease for some time. Barbara came to crime fiction late after writing historical romances and non-fiction. Her first crime novel, Playing God, had an interesting background of the York mystery plays. It became the opening entry in her "York cycle of mysteries", which eventually ran to 8 titles spanning a decade of publication. Her main character was Detective Superintendent Bob Southwell and she was especially good at evoking the atmosphere of York Minster and the wonderful old city around it. I think it is fair to say that Barbara was always rather more interested in character and setting than mere ingenuity of plot, and there was a quiet competence and humanity about her writing. Her second crime novel had the title The Girl in Red Suspenders, which may have prompted expectations in some readers of a racy and melodramatic thriller – but in fact, the book was another soundly constructed story typical of Barbara's mysteries. In later life, Barbara acquired a fascinating home – the Brontë Birthplace in Thornton, near Bradford. On one memorable occasion she invited the northern crime writers to visit the house. I took my family along and I found it really fascinating. In the end, the upkeep became too much for her, and she lost touch with most of her fellow crime writers. However, I remember Barbara with a good deal of affection and I still cherish a number of her novels which she inscribed to me. Her last crime novel appeared as long ago as 1998, but her work remains well worth reading, especially for anyone who loves the city of York.